Imagine waking up one day and discovering that you'd missed the Apocalypse. That's what happened to Rick Grimes. Once a Sheriff's Deputy, he fell into a coma after being wounded in the line of duty. Upon waking up, he finds his town in ruins, his family missing, and the dead walking the earth. Determined to survive, Rick must adapt to the new world around him. 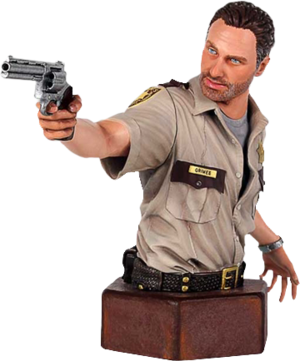 From the screen to your shelf, Gentle Giant is proud to bring you the Sheriff Rick Grimes Mini-Bust. Based on the hit AMC series, this bust boasts a likeness of Andrew Lincoln in his sheriff's uniform as he appears in the series' pilot episode. The bust comes with his pistol drawn, ready to take down criminals and walkers alike. Cast in high-quality polystone and painted by hand, this limited edition collectible mini-bust is hand-numbered and comes with a matching Certificate of Authenticity.